Oh man is that good! That’s exactly what ran through my head after a big gulp of this smoothie. Kiwi, strawberry, and banana are a match made in smoothie heaven. This smoothie is perfect on a hot summer day, for dessert, for those picky kids, or as a healthy snack or meal. The incredible taste will have your taste buds jumping for joy while your body gets a healthy dose of nutrients. Before I get to the actual recipe, let’s take a quick look at the health benefits attributed to kiwis, strawberries, and bananas. Like kiwis, strawberries are rich in vitamin C, dietary fiber, and potassium, but also contain ample amounts of manganese, folate, iodine, magnesium, and vitamin K. These nutrients lead to the reduction inflammation, good eye health, cardiovascular protection, anti-cancer properties, and promote strong, healthy bones. Load the ingredients into your high speed blender and blend for anywhere from 30-45 seconds – or until the desired consistency is reached. 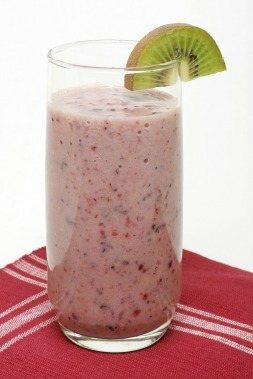 Please leave a comment below if you try this kiwi strawberry banana smoothie. Happy Blending! Smoothie was awesome! I added both yogurt and blueberries to it.. Pretty tasty! I’m on a big healthy living kick since I turned 18 & got out on my own. Thank you so much for this recipe, the spinach makes an amazing addition! Hi Cheyenne, nice to hear you’re on a health kick and that you enjoyed this smoothie. To your good health! Hi Meha, I know what you mean. For years I only ate a few varieties of fruits and veggies – the textures were the main reason I couldn’t stomach them. Juicing and smoothies were my method of forcing them down, which ultimately changed my palate and led to enjoying a wide variety of produce. Glad you found a delicious way to get these healthy foods into your diet too. Cheers! Just tried this it’s amazing!!! I added spinach and frozen blueberries. I also clean the banana peel and kiwi skin and I throw them in there too. Extra benefits! Way to take this smoothie to the next level, Kate! I typically use the entire kiwi, but banana peel, that’s new to me. Going to have to give it a try. Cheers! Make sure to use organic esp. if you are going to use the peel, as bananas and other tropical fruits are frequently sprayed with fungicide and other pesticides. Don’t want that toxicity in your system! We are out in the us on vacation at the moment and with these ingredients in plentiful supply, I just made this smoothie for myself, husband and our children with their breakfast this morning. I’m tempted to add spinach but worry that the children might not like the taste. How does spinach change the taste? Spinach won’t affect the taste much. Maybe try just a 1/2 cup of baby spinach at first. Odds are nobody will notice a difference. Do you have the nutrition facts for this smoothie? I don’t, Joseph. I might add that info to my recipes in the future. Made the smoothie with Almond Milk instead of water and no ice cubes and added strawberry carnation instant breakfast. Thanks! My daughter and I loved our PINK SMOOTHIES! Pink smoothies, I love it! Hey Julie, awesome to hear you enjoyed this smoothie recipe, adding Greek yogurt was a nice touch. Cheers, Ryan. Your comment is music to my ears. Getting the whole family involved is fantastic! I just made this with the 1/4 cup yogurt (plain Nancy’s brand), and I reduced the water to 1/2 cup. Turned out PERFECT. My new favorite combo, for sure. I can’t wait to try it with greens and/or blueberries. Thank you! A PERFECT smoothie is a great thing :) Glad to hear you enjoyed this recipe and are experimenting with variations. I did half cup water, half cup unsweetened coconut/almond milk. I also added the spinach. It has a wonderful tropical taste! Awesome, Amanda! Thanks for sharing your delicious sounding version of this smoothie. When I made it 1 cup of water made it too watery. Try 1/4 or replace with vanilla yogurt. This smoothie can turn out a little runny if you don’t use ice or cut down on the water, as you found out :) Yogurt helps thicken it up too. My husband surprised me with the new Vitamix 7500 yesterday for my birthday. This was my first experiment with my new machine. It was delicious. I left out the water and used 1/4 cup of almond milk and a few cubes of ice. I also added the spinach and 1 tbls of flax seeds. Great to hear your first smoothie was a success. Here’s to many more delicious and nutritious smoothies! I added Apple juice yogurt blueberries and spinach leaves! So yummy! Nice work on the add-ons, Skylar! You can use all three. Although you might only use water or yogurt if you like thicker smoothies. Has anyone tried almond milk with this? I tried this recipe and it has a great taste but It wasn’t pink. I put on some more strawberries and even a little piece of beet but still nothing. I don’t know if I put too much spinachs. Any suggestions. Maybe your strawberries weren’t as red and juicy as the ones used for the picture. The taste is much more important than the color. I don’t understand why it turned out so watery. Maybe adjust the water levels in the recipe. The banana and ice cubes usually result in enough thickness. Like you suggested, try using less water next time. I substituted 1/2 an avocado for the oil (didn’t change the flavor at all, if anyone is wondering, and thickened it up) and added slivered almonds and chia seeds. Frozen fruit made it thicker too. Pretty sure I inhaled this in less than 5 minutes. I’ve read that consuming the drink more slowly is beneficial to getting the absorbtion of nutrients. Yes, that is correct, Ron. The slower you drink the more you activate enzymes that breakdown your food. 1 cup of water will suffice, Sky. Do I have to add the coconut oil? You don’t have to do anything you don’t want, Emily :) The coconut oil provides some healthy fats, but you can omit or substitute with a little ghee. I’ve made this smoothie a few times now, and it never fails to impress me! I love it so much! Sometimes I replace the water with orange juice and it tastes super good!